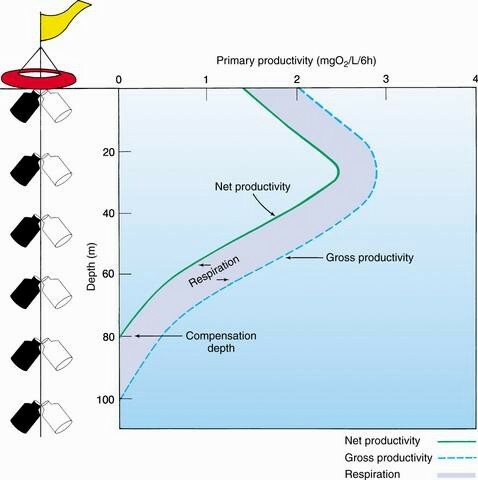 The figure shows the relationship between the water depth and net primary production (=P-R). I want to know why the production (P) initially increases with water depth near the surface? I have seen similar relationships from other sources but never seen a clear explanation. Depth profiles of phytoplancton photosynthesis, such as those in Fig. 10.4, determined by the suspended bottle method, tend to overestimate the extent to which photoinhibition diminished primary production. In nature, the phytoplancton are not forced to remain at the same depth for prolonged periods. Some, such as dinoflagellates and blue-green algae, can migrate to a depth where light intensity is more suitable. Even non-motile algae will only remain at the same depth for extended periods under rather still conditions. I hope I got the quotes right (quick manual retyping). There are many more relevant sections in the book as well, which seems to cover all kinds of aspects of aquatic photosynthetic efficiency and how this can be a function of depth. I think it has to do with what wavelength of light is absorbed by photosynthetic organisms at what depth. Ultraviolet light with short wavelength is absorbed closest to the surface. Red light (which is responsible for photosynthesis) is absorbed at a deeper point in aquatic systems by the primary producers like phytoplankton and metaphyta which increase the productivity of that particular depth. Compared to the surface, slightly below the surface in the water column the availability of nutrients increases as winds and ocean currents cause increased mixing of nutrient rich deep water. The photic zone of the water column is quick to use up the macronutrients necessary to sustain primary production, however upwelling of nutrient rich deep water becomes a significant factor in determining an area's production. Not the answer you're looking for? Browse other questions tagged ecology marine-biology energy ecosystem limnology or ask your own question. Does gross production (P) and biomass (B) mean the same? What does the difference between GPP - NPP represent?